Mobile opens now capture 49% of the market share so overlooking mobile-friendly emails is a big mistake. 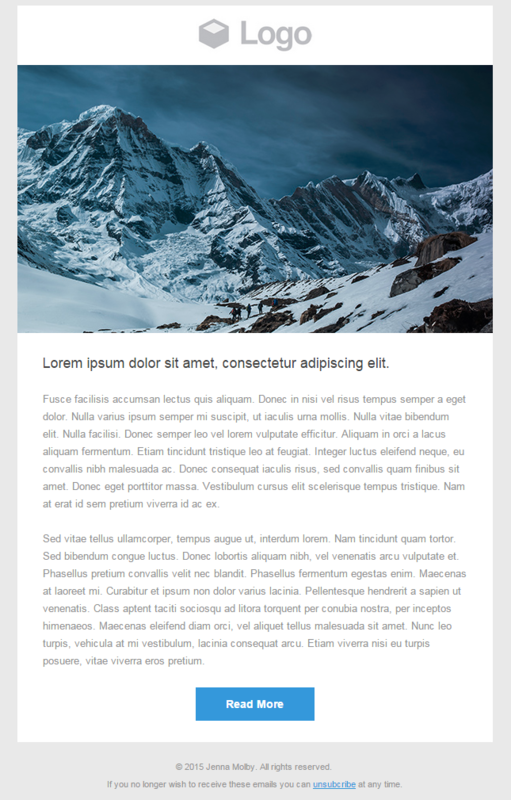 In this tutorial, I’m going to show you how to code a simple, responsive HTML email from scratch. Here is a preview of what the email will look like. This tutorial will break the email down into 3 different parts. If you’re already comfortable with the HTML and styling, you can jump to the media queries section. Start by creating a new HTML file within your favourite HTML editor. I like to use Dreamweaver for emails, but tools like Sublime Text or Notepad++ will work too. The first thing we need to do is to create a table for the background colour of the email. On the web, this can easily be done by applying CSS to the BODY tag. However, email is a bit more complicated. CSS needs to be added to the BODY tag and a 100% width table needs to contain the background colour as well. Update the body tag to also have the same background colour as you chose for you 100% wide table. Next, create a table that will hold the contents of the email, within the table cell of the 100% width table. The email should look like this. Create another table that will container the header and insert the logo. Give this table a width of 90% and center it. This will create some padding on either side. Now, the email should have the logo in it. Directly under the header table, create another table to hold the banner image. The email will now contain the banner image. Directly under the banner table, create another table to hold the main content for the email. This table should be the same width as the header (90%) and should be centered, to create padding on each side. Sed vitae tellus ullamcorper, tempus augue ut, interdum lorem. Nam tincidunt quam tortor. Sed bibendum congue luctus. Donec lobortis aliquam nibh, vel venenatis arcu vulputate et. Phasellus pretium convallis velit nec blandit. Phasellus fermentum egestas enim. Maecenas at laoreet mi. Curabitur et ipsum non dolor varius lacinia. Pellentesque hendrerit a sapien ut venenatis. Class aptent taciti sociosqu ad litora torquent per conubia nostra, per inceptos himenaeos. Maecenas eleifend diam orci, vel aliquet tellus malesuada sit amet. Nunc leo turpis, vehicula at mi vestibulum, lacinia consequat arcu. Etiam viverra nisi eu turpis posuere, vitae viverra eros pretium. No styling has been added yet but it should start to get some structure. Inside the main content area (right underneath the text). Create a new table that will act as the call-to-action button in the email. If you no longer wish to receive these emails you can <a href="#">unsubscribe</a> at any time. All the HTML is done. Now, the styling can be put in place. 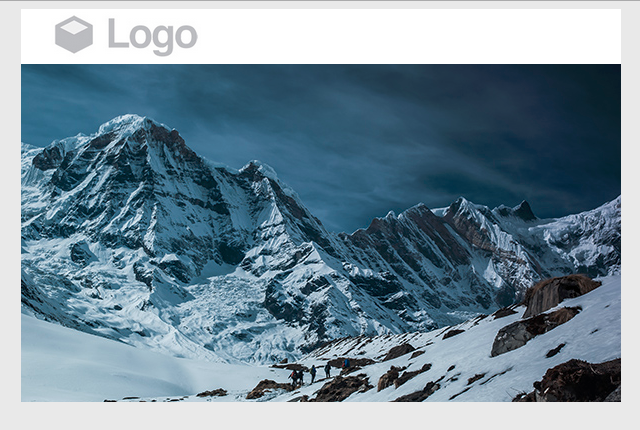 Add some padding to the header and center the logo. The CSS has to be inline and inside the tag. If you no longer wish to receive these emails you can <a href="#" style="color:#3498db">unsubscribe</a> at any time. Here is what the code looks after adding all the styling. The viewport meta tag needs to be placed right before the title tag. .device-width: This will be added to the 600px container table and the image. .btn-full: This will be added to the table that was created for the button. 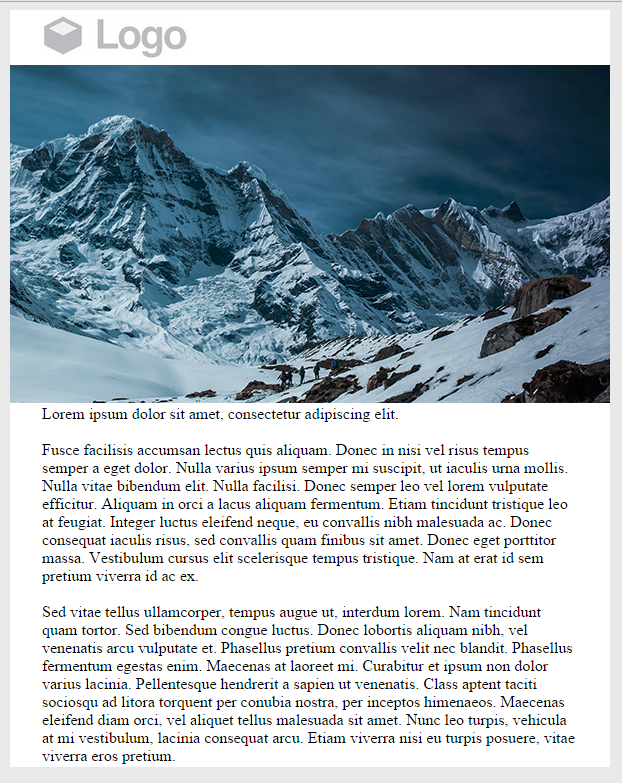 Add the class device-width to the big image and the 600px wide container table. Also add the btn-full class to the table that contains the call-to-action. Now if you shrink down the email template, it should detect the screensize and scale the email perfectly. This is awesome, thank you for making it easy to follow. Thank you for the break down - it makes it so much easier this way for those trying to get started and for getting your head around responsive email.